Here at David Inglis & son we offer professional services to businesses, private householders and the public sector, always delivered with pride, professionalism and integrity. We have selected a team of sub contractors who work with us to give you a hassle free, professional service from start to finish. All our employees are fully qualified members of the Constriction Skills Certification Scheme with key employees trained in the use of mechanical access equipment, tower scaffolding and appointed person first aid skills. We have a good range of access equipment to allow us to work safely and easily in and around your building. 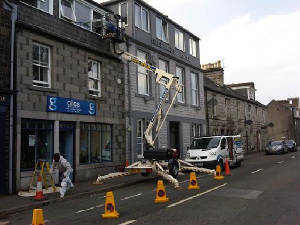 If our own ladders, cherry picker or scaffolding cant get us safely to where we need to be we can arrange other forms of access to allow us to safely complete your job. Check our photo gallery page to see some of the work we have carried out. Call us or go to our contact page for further information and a quotation for your job.